chaining your workouts and making progress. We believe building a solid base for strength, training your local anaerobic fitness in the most efficient way and chained training plans are the missing links in many climbing training routines. Often strength training in climbing applies only specific strength training without a solid overall strength, which results in injuries. Training for power endurance and endurance is often done without enough training load and optimal recovery times, and without a descent plan. Based on this fact and looking at existing training methods in other, upper body, anaerobic and high intensive sports, we have built the FITclimbing HIIT and Strength Workouts. So, we didn’t invent a complete new way of training. We just looked to how other sports(wo)men are training, knowing that a well-developed foundation will be more receptive to the loads imposed by specific training. HIIT and Strength Workouts start on your own level to train endurance, power endurance and strength. You can easily chain from one workout to the next one to progress. Our workouts are mostly physical training programs. That doesn’t mean that we think climbing technique, tactics and mental training aren’t important. You can easily integrate these parts of training into the workouts. So prevent yourself from injuries and unlock your full performance potential. Build a solid framework and chain at your own pace for having a lifetime injury free and a balanced climbing life. Our H(F)IITclimbing workouts are developed using the 25 years of expertise in training, physiology and internet technology of Polar. With this and our own climbing training experience we believe we have built a powerful training program. with your own online climbing coach. 660 HIIT Workouts for climbing and bouldering. 120 Strength Workouts based on fundamental climbing movement patterns. Keep on track of your nutrition. Available in Google Play or Apple Store. Also accessible via the PC. 1. Who is FITclimbing for? For every climber who wants to train in an efficient, balanced way. Whether you are a competition athlete or a recreational climber you have to build a solid base to increase your training load. If the framework isn’t right, it may limit future progress. Plan workouts at your own level and chain easily from one workout to the next one to make progress. 2. Why are HIIT Workouts so effective? The HIIT schemes don’t let you to choose your own rest periods. The non-linear programming in the app means that the workouts aren’t predictable. They are programmed to have an optimal training load and recovery time. You can choose your own start level and easily chain from one workout to the next one to make progress. Want even more advanced training? Use a heart rate monitor to make 100% sure you are training at the right intensity. Whether you are a competition athlete or a recreational climber, a good physical frame is important to avoid injuries and unlock your full performance potential. Often, strength training in climbing ends up with only specific strength training without a solid base of general strength resulting in injuries. Climbing does look like a full body workout, but some muscle groups are easily forgotten. Forget about training single antagonists but build a solid base with strength workouts based on fundamental climbing movements. 4. Why training with a heart rate monitor? Because “If you can measure it, you can (im)prove it”. It’s important to create an optimal balance between load and recovery, whether you are in the middle of a workout or between two workouts. You can measure training intensity (load) and your recovery with heart rate monitoring. Training less than 40% in heart rate zone 4 – 5 indicates your workout is too easy. Tracking more than 40% in zone 4 – 5 means you’ve reached the right intensity to trigger muscle and vessel growth and develop local anaerobic fitness. Take-over by user and (now) ‘Coach Irene’ and further development of the product FITclimbing to help climbers to start training. Bringing the app into service with HIIT workouts and strength workouts for climbers where clients can plan their own personal training schedules or train with the support of a coach. Started with making personalised High Intensity Interval Training programs for clients under the name Topfit. With personal feedback from information gathered in Polar Flow.  Polar Netherlands endorsed the findings about sport climbing and heart rate zone training and has since been a partner in the search for optimization of training for sport climbing. Try out phase with several training methods by using a heart rate tracker. Started learning the do’s and don’ts of training in different heart rate zones. Inspired by the systematic training routine when coaching an Olympic athlete, Michel Kleinjan launched the idea of making climbing training mainstream.